A newspaper article about St.Marys Church, St.Annes. St.Mary's Mission Church, Orchard Road (site of present synagogue) was erected in 1893. The first curate-in-charge was the Rev. A.D.S.Studdy, who resigned in 1894. 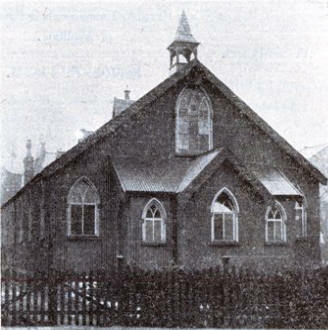 For three years following it was served by the Parish Church, but in 1898 it became imperative to do something more to supply the ever-increasing needs of such a growing locality, and a determined effort was made to start the building of a large permanent church. The Rev.C.H.Ellison was appointed curate-in-charge. St.Thomas' Church was consecrated on 22 June 1900 and the Rev.C.H.Ellison became the first Vicar. About 1928 St.Mary's was sold and became the headquarters of the St.Annes Women's Conservative and Unionist Association. The old church was was presumably demolished when the synagogue was constructed about 1939-40.